A spam trap looks, in almost every respect, just like any other email address. Unfortunately, it can be very dangerous to those who are regularly sending out mass emails. Spam traps are designed to identify people who are using less than savory practices to collect email addresses — but that doesn’t necessarily mean that you’re safe just because you aren’t. Here’s how to identify, avoid, and remove spam traps. Spam traps are email addresses that don’t belong to anyone. Instead, they are designed to identify businesses who have purchased email lists, scraped email lists, hacked accessed email lists, or are simply emailing random email users rather than consumers who have expressed an interest in their business, services, and products. Spam traps are set by email service providers, email security services, and spam blocking services. Spam trappers have the ultimate goal of reducing the amount of spam that their users get, by identifying individuals and businesses who may be sending their users unsolicited emails. Pristine traps are newly generated emails that are either put on email lists or placed on websites, to be potentially scraped by a script. Recycled traps are email accounts that have been abandoned by a user; new solicitations indicate that someone may be purchasing old email lists. Functionally, a spam trap is very simple: the spam trapper waits until someone has emailed them, and then blacklists the domain or IP that the email came from. However, the spam trapper doesn’t just blacklist the sender on that email account — it blacklists the sender across all of its services. How to Avoid Spam Traps? Spam trappers “seed” email addresses by entering them into long lists of hacked personal information or sold email accounts. Thus, they know that an individual or business has purchased one of these lists of that email account gets an email from them. These email accounts are otherwise completely uncirculated. It’s possible to avoid spam traps nearly entirely by getting your email addresses directly through your website and from consumers who are interested in your products. For a variety of reasons, purchasing lists or getting them online normally doesn’t help a business; it only gives you a list of customers who aren’t likely to be interested in your product and yields very poor engagement. Spam traps can also be avoided by having customers “opt-in” to your emails and confirm whether they want to receive your emails. A spam trap will not confirm that they want to receive emails, though they will still get the first “opt-in” message if someone does use the email address to sign up for your email communications. However, few can entirely avoid spam traps because it is still possible for customers to use fake email addresses that link to spam addresses, or for spam trap addresses to be accidentally entered into your website. How to Identify Spam Traps? Automatically scan lists for known and potential spam traps. Identify the hallmarks and patterns of spam traps to remove them and protect your IP reputation. Make sure emails are properly formatted and valid. MassMailer uses multiple verification processes to ensure that emails are valid, reducing email bounce rates. Find anti-spam honeypots. There are frequently honeypots created on Gmail, Yahoo, and Hotmail. Identity these and protect your organization from getting trapped. Through an automated spam trap finder solution, identify 90 percent of trap emails, thereby improving the overall quality of your lists. This can even be used on purchased lists, to improve your audience reach and scale your marketing quickly. How to Remove Spam Traps? Without automated spam trap removal, there are some best practices you can follow — however, these will have limited effectiveness in removing all your spam traps. Clean up your email lists. If there are customers that are not engaging with your business, they may not be real customers. An automated email can be used to make sure they still want to receive your emails. This keeps your list fresh and your metrics easier to track. Return path certification can give an email sender detailed information about their recipients, including whether they are likely to be a spam trap. Look at known blacklists. There are services that provide active blacklists, so you can determine whether you may already be on them. A reputation monitor will tell you whether it appears that you’ve experienced a recent issue with your reputation, which could indicate that you now have spam traps on your email lists. Reputation monitors can help in a variety of ways and are almost always advisable. The SNDS is a Windows Live Hotmail service that makes it possible for businesses to check recycled spam traps to see how active they are and whether they are being connected with. Ultimately, spam traps are pretty good at doing their job: identifying businesses and individuals who have purchased email lists. If you are interested in building your lists quickly or growing your contacts fast, spam traps are likely to find you — unless you have technology that can help. If you already have a domain that has been blacklisted or that has traps on its list, the work might be a little more complicated — but there are tools available out there to help you start rebuilding your email reputation. The earlier you start, the faster you’ll be able to begin reaching our recipients again. Spam traps are dangerous and the effects of being caught in a spam trap can be spectacularly long-lasting. Through automated spam trap finder solution such as MassMailer, identify 90% of trap emails, thereby improving the overall quality of your lists. This can even be used on purchased lists, to improve your audience reach and scale your marketing quickly. 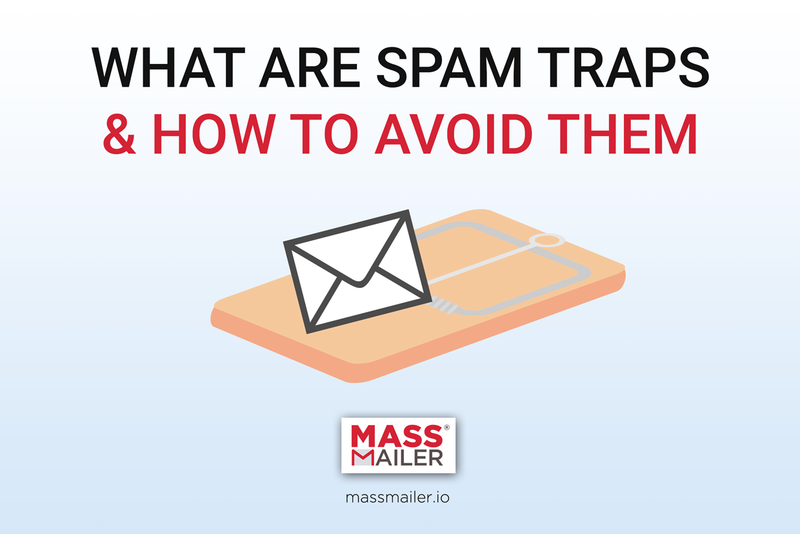 If you want to protect yourself from up to 90% of spam traps, contact the experts at MassMailer.